Yesterday being a bank holiday, we decided to slum it and go to McDonalds. We toyed with the idea of ordering via my phone and having a home delivery, but this would incur an additional £5 charge. So, we decided to drive to our local High Street and get a takeaway. Now for those who haven’t been to McDonalds for a while, there are now separate order and collection points in the “restaurant”. If you especially despise human interaction you can use one of the touch screens to order and pay. I guess the older system where food was pre-prepared in anticipation of purchase proved too wasteful. Who can say? Whatever the reason, serving the needs of the customer was probably the last consideration. But I digress. I duly made my order then tried to stand in a place where I didn’t obstruct other customers and waited for my order to be prepared. There’s a large information screen above the collection counter so you can track your order number which is printed on your till receipt. It took 12 minutes to prepare my food from scratch, which I considered reasonable as it was very busy. Not all felt so accommodating. However, it should be noted that two thirds of those waiting for their orders where not customers but delivery drivers. All of whom were dressed accordingly for driving mopeds and other sundry velocipedes. Although all seemed to be amicable individuals, their bulky attire and restricted vision due to their helmets, meant they often got under each other’s and everyone else’s feet. I also noticed on the information screen that online orders had a different identifying code. Furthermore, it appeared to me that these orders were being given priority, as they tended to be far larger in quantity. I’m sure I wasn’t the only customer to deduce all this, given the grumbling by some of the waiting. Again, although this system may work well for the staff both cooking and serving, I remain sceptical of it’s merits from a bog-standard customer perspective. Now this anecdote is a segue into a wider point about delivery culture as this post is not exclusively about the iniquities of McDonalds in the UK. On demand culture is everywhere these days. If it can be sold and physically transported, then retailers will offer to bring it to your door. Due to recent family illness, I too have availed myself of these services. In 2017, I don’t think a week went by without an Amazon, Argos or grocery delivery of some kind arriving. If you want it now, then you can effectively have it now. But like any cultural change there are consequences and knock on effects. Traffic and therefore pollution levels in Greater London are on the rise, despite regulation of vehicle emissions and legislation such as the congestion charge. The sheer number of vehicles on the road is growing, rapidly. 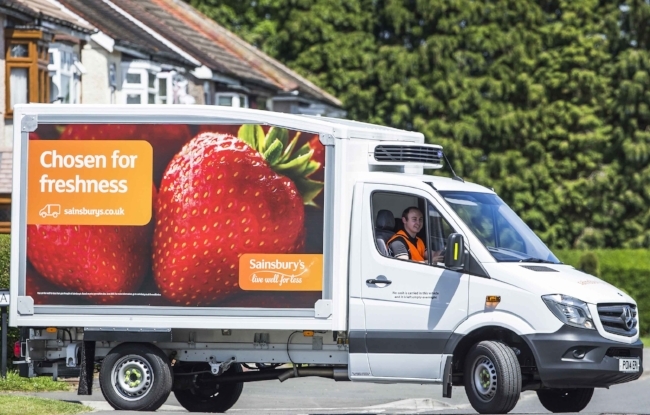 Department for Transport figures show the number of delivery vehicles registered in the capital rose by 12 per cent in the last decade, partly driven by internet shopping. Last year, around 7,300 entered the capital every hour during the morning rush-hour. At the moment, a perfect storm of economic factors has made delivery culture both viable and marketable. Fuel prices have dropped and until recently, low interest rates and inflation have buoyed consumer spending. Need I drone on about the shift in our culture towards the commodification of everything and happiness through consumerism? But there is scope for the financial stability of the UK to change in 2018 and it is not impossible to conceived of operating costs increasing to a point where delivery culture no longer remains cheap and accessible to all. Potentially, something that is currently a universal convenience, could end up becoming yet another indicator of the divide between the haves and have nots. Then there are other aspects of this phenomenon to consider. Home deliveries are a contributory factor to the ongoing slow death of the local high street. Online retail is killing local businesses. Furthermore, not going to the shops is yet another nail in the coffin of the populations general health and wellbeing. This post initially stemmed from a simple observation made from day-to-day life. Perhaps it is my age and my increasing awareness that I’ve seen so much change during my lifetime, that makes me ponder on such matters. Like many issues, the more you dwell upon it, the more convoluted the matter becomes. As I write I’ve just been struck by the irony of a McDonald’s home delivery. Fast food, which for years has been labelled the ruination of a country’s health, is now being brought to your very front door, thus negating the small health benefits brought about by going to the “restaurant” in person. As for delivery culture, I suspect it is ultimately both economically and environmentally unsustainable. I wonder what will happen when it becomes unavailable to certain parts of society? How well will such a change be received? If there are indeed, major economic problems ahead, will there be a time when home delivery couriers become the target of increased crime? Only time will tell. I hate to end the post here, with so many unanswered questions but I have to go. You see I’m expecting a delivery later.